Happy Kitchen Sink Stamps Monday, I'm so glad you stopped by today! I used SCS270 as my layout inspiration, incorporating Basic Grey Lime Rickey paper for some fun color. 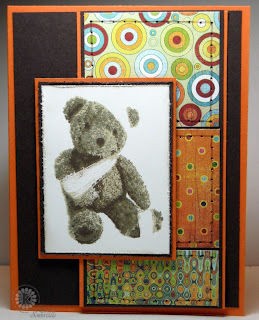 I used Kitchen Sink Stamps 3 Step Get Well Teddy as my focal image stamping, in shades of brown. I've created a video to go along with this weeks image, to help you understand the Multi Step Stamping process. I hope you've been finding these videos helpful! Very cute and fantastic card, Lisa! I love the combination of the DPs! Wonderful tutorial, too!! Oh this is just sooo adorable, Lisa!! What a wonderful mix of papers!! Love these sensational papers with your delightful get well bear!! I'm also loving your videos!! I watch every single one to hear your sweet voice!! Love the teddy bear and that fabulous Basic Grey DP. Another beautiful card! another fabulous creation with KSD the teddy is so cute...and the PP perfect. I am really enjoying your tutorials. CUTE teddy! And loved the video:) TFS!